OLDRIGHTIE: So Less Than 24 Hours To Go. So Less Than 24 Hours To Go. I Can Think Of No Better Way To Close My Small Input. Well I was wrong, Boris saw it through to the end and made a fine speech there. I should imagine Deceitful Dave was gritting his teeth when he saw the popular approval Boris got, think his use by date is just about here. Thank you for your work OR and the inspiration you have given. Just watched Paxo's debate on channel 4 and sad to say if that's what people really think then the UK is well and truly fucked! Now you won't have to go and live in Russia - maybe it will come to us. YAY never thought we'd pull it off, and the Pig Molester has thrown the towel in too, it doesn't get any better. Big job just broke out.....Brickies & Hoddies wanted for refurbishment work on Hadrians Wall. Thank you for that, brought tears of pride & joy to my eyes. 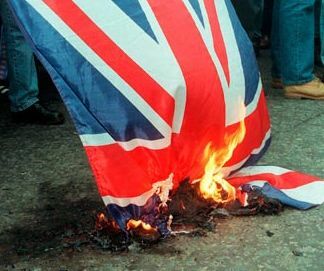 My generation, born during the war, were brought up to feel we had hit the jackpot by being born British but that feeling has been sneered at by leftie luvvies, epitomized by gobshite Geldof and his fan club waving 2 fingers at Farage's flotilla in support of our decimated fishing industry. Seems all ethnics are worthy of concern, but not our own struggling communities. Please if you ever see this POS, shout abuse, throw rotting veg, show him your contempt and maybe he will skulk off never to be seen again, hurrah! Vera, I would gladly give the POT (US) your message alongside my own!